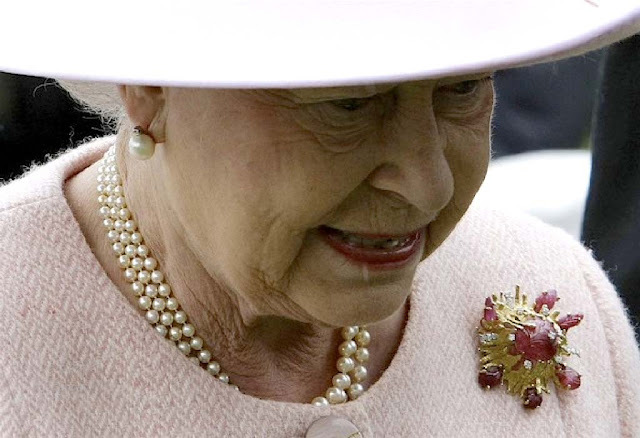 I love the Queen’s stunning carved ruby Grima brooch! When I was thinking of what ladies I might turn to in order to find a picture of one of them wearing a brooch I of course first thought of the Queen of England because of her amazing collection of jewelry! She always adds a brooch to her ensembles, which I love, and when I saw this photo of her from 2011 wearing a drop-dead gorgeous carved ruby and gold brooch by Grima it led me to their website and I am now in love with their work! Swing by when you get a chance, they have some amazing pieces to drool over. The company was founded by Andrew Grima in 1960s and continues today under the helm of his wife Jojo and daughter Francesca. I read on Grima’s Instagram account that this particular brooch is special to the Queen because it was given to her by her husband, Prince Philip. I wonder if he had help picking it out, as in, did the Queen drop a hint that she wanted it, did someone at Grima help him select it, or does he just have incredibly good taste? 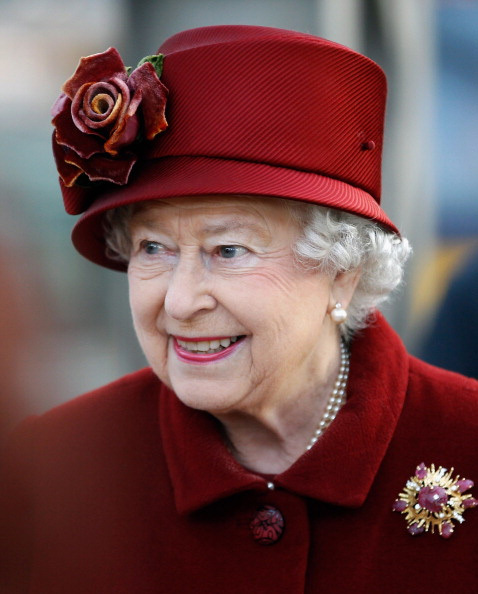 I love that she wore this Christmas red suit to a visit to Liverpool in December of 2011 and that her Grima brooch was paired with a hat and pearls! Worn here in 2009 with pale pink but also with the pearl necklace and earrings. Let the Queen’s lovely Grima brooch be your friendly reminder that the December “How I Wear My” roundup is devoted to brooches! 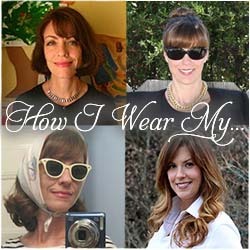 We would love to see how you style yours. Send photos to us at howiwearmy@yahoo.com by December 7, 2015.